Eat Your City: Japadog Waterfront Station and Robson, Downtown Vancouver, BC - Awesome hotdogs! 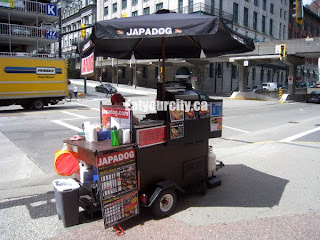 Japadog Waterfront Station and Robson, Downtown Vancouver, BC - Awesome hotdogs! If you haven't heard about Japadogs, then please come out of your shell and eat some!!! 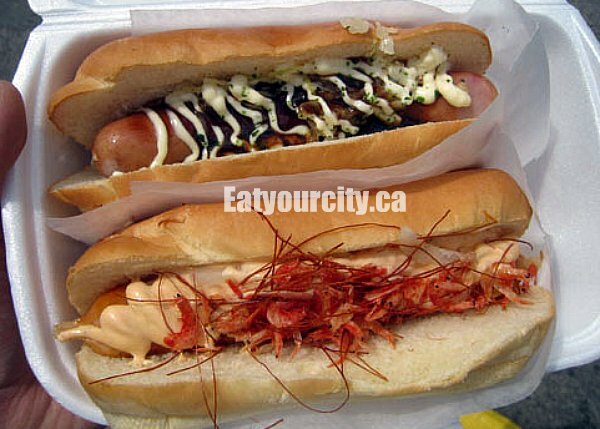 popularized a few years ago, these tasty hot dogs stuffed with a variety of different seafood/meat inside and yummy off the hook toppings like dried shrimp, special Japanese sauce, green seaweed, fried sauerkraut​, fried onions, teriyaki sauce, raw sweet white onions, and even yes, soysauce...its not hard to see why they're and integral part of the street food scene in Vancouver. 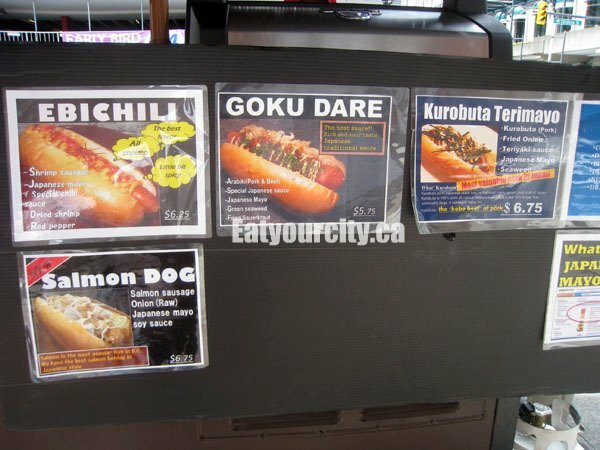 With so many choices.. which one, which one...? 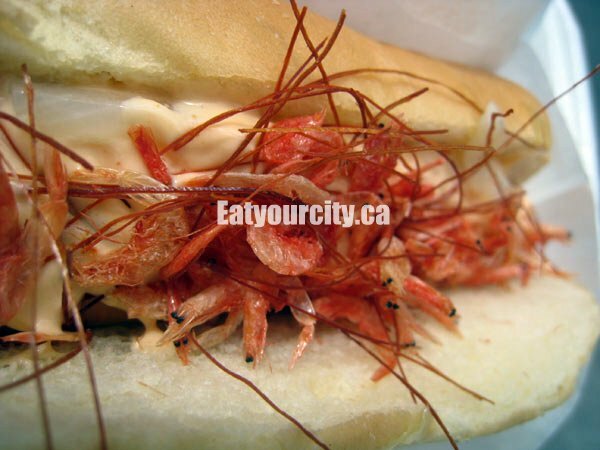 A close up of the tasty dried shrimp... they tasty way better than they look! 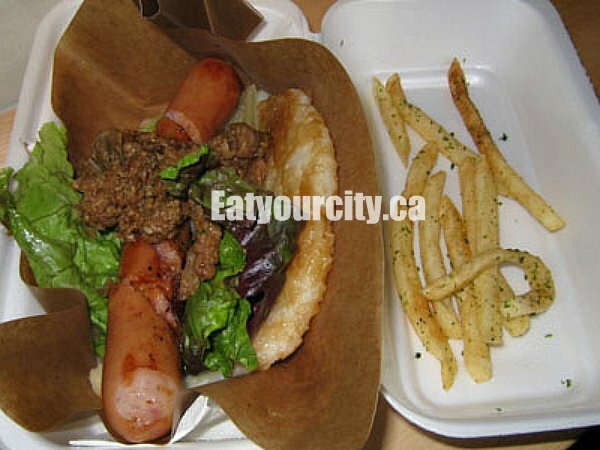 We also had the Yakiniku in a neat flavoured and compressed rice bun, with well done BBQ style beef on top of a juicy arabiki sausage with teriyaki sauce, a small leaf of romaine lettuce and a side of incredible fries covered with seaweed flakes. Sorry, couldn't stop eating the fries before I had a chance to take a pic heehee...Mmmm! Swung by later on the same night to have the Love Meat . Yes, you can head out and get some love meat lol!!! 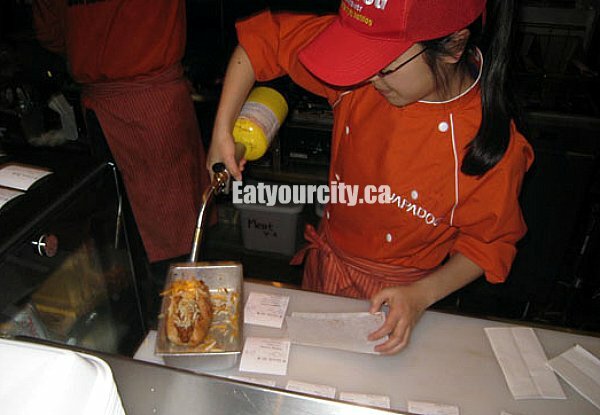 Essentially a chili cheese dog, with homemade meat sauce covered with cheese - melted by propane torch! 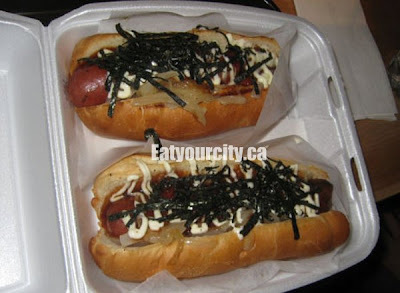 We also picked up one of our favs -the Terimayo an all beef hotdog topped with fried onions, a salty and sweet teriyaki sauce, creamy japanese mayo,and a good sprinkling of crisp toasted seaweed. Mmmm!